A small percentage of investors, it would seem, preemptively jumped ship immediately after seeing the headlines, which pulled AAPL stock down a measly 1% in the early hours of the trading day. However, Apple stock did not enter a nosedive and instead finished the day up a fraction of one percent. What this implies is that AAPL shareholders aren’t concerned about the possible ramifications of a patent lawsuit involving Apple Pay. Why should they be, anyway? Over the years, Wall Street has seen so many patent infringement lawsuits against Apple that analysts and investors don’t even flinch anymore. Even when pitted against similarly massive and formidable adversaries, AAPL has been successful in dragging out the legal process in these cases long enough for the issues to become stale and reach “old news” status, taking a back seat to the next scandal or gadget to capture the ever-shrinking attention span of the American public. What Are the Accusations Against Apple and Visa? The New York Times story elaborated on the available details of the case, explaining that Weiss “received 13 patents for authentication systems that use a smartphone, biometric identification such as a fingerprint and the generation of secure one-time tokens to conduct financial transactions.” Back in 2010, he held meetings with V executives to discuss licensing his patents, and made (unsuccessful) attempts at arranging similar meetings with AAPL management. According to Weiss, Visa signed a 10-year non-disclosure agreement in exchange for obtaining access to his research under the guise of cooperating to further develop it into a functional consumer-ready product. However, once V had been granted access to his technology, all communication ceased and he was unable to re-establish meaningful dialogue. Simply put, as soon as Weiss handed over the keys to his revolutionary technology research, Visa went dark. Weiss was advised by his attorneys, the firm of Quinn Emanuel Urquhart & Sullivan — the same firm that represented Samsung Electronics (OTCMKTS:SSNLF) in similar patent lawsuits against Apple — to file suit, rather than attempt to negotiate or urge AAPL and V to arrange for a license. Considering the seemingly blatant manner in which Visa ignored and dismissed all of Weiss’ efforts to remedy the situation, the lawyers’ recommendations come as no surprise. Given the lack of any relevant reaction from either AAPL or V stock after news of the lawsuit filing was released, I think it’s safe to assume that share prices will not be dropping as a result. Everybody knows that lawsuits, especially ones involving behemoth multinational corporations like Apple, can take years to reach a courtroom, if they even last that long. Weiss’ complaint appears (at least on the surface to non-lawyer types like me) to have possibly substantial merit. 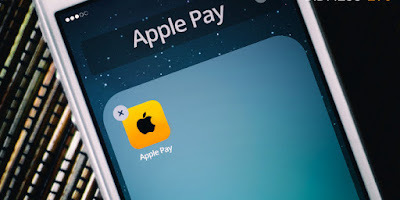 But, since Apple Pay is essentially the culmination of the entire basis for the lawsuit, there is the chance that operations could be negatively impacted if this case ever actually saw the inside of a courtroom. Any disruption in Apple Pay services, however small, could pose an unacceptably high degree of risk to the program’s continued growth, as well as AAPL stock and V stock. This is also why I fully expect this case to be settled long before reaching a trial date, and instead we’ll be reading news of a massive payout arrangement for Weiss.